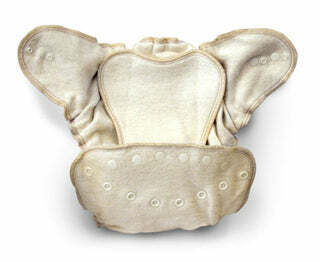 Growing Greens Made Of Organic Cotton one-size fitted diaper by Babee Greens. Made in USA. Growing Greens by Babee Greens is a one-size fitted diaper. Trim fitting. Narrower through the rear and narrower through the crotch than our other fitted diapers, thus nice for fitting under regular clothing. They are quite adjustable through a very large size range, narrow hips to wide hips. A snap-in doubler can be removed for little ones then snap it in for older babies. They don't take forever to dry, either. Very absorbent! This is a wonderful diaper for those who prefer snaps. Beautiful. The elastic is sew curved all the way to the edge, which is a superior sewing method because it provides a good leg fit and better containment than economy fitteds do. You can see the difference in the placement and sewing of the leg elastic area if you look closely at the pictures. 100% cotton without polyester and without rayon. We love cotton! It's soft, absorbent and washes easily. Made of organically grown cotton fabric which is grown and milled locally 100% USA - from the field all the way to the finished product. Only the highest quality eco-friendly fibers in the production of Baby Greens products, including the thread! 100% unbleached cotton thread and natural latex free elastic. Even the threads are cotton where as other brands use polyester edge thread. See this on a baby. This diaper is terrific because it is organic and made in the USA. Handmade in Asheville, NC. Need this in size newborn? See Growing Greens Newborn Fitted Diaper from Babee Greens. Babee Greens is a 100% natural fiber company. We never use man-made or synthetic fibers. At Babee Greens, we design and manufacture all of our products in the beautiful mountains of Asheville, North Carolina, USA. These are not made to last. These are not made to last. Within 8m there are literally holes chewed through the material. The material is rough, super thin and the elastics have lost all elasticity- poop leaks right out onto the cover. I use tide and I use bleach when needed (like during a yeast outbreak). If a diaper can't withstand bleach how can it possibly withstand the ammonia in a baby's urine? If you want a super soft absorbent fitted try the organic workhorse and Happy Heiny's Hemp fitted. Those two are awesome:) I like the workhorse throughout the day, Bummis Dimple Diaper at night and Happy Heiny's when I want trim. 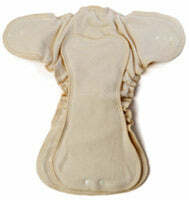 I realized something in my quest for a trim cloth diaper- most cloth fitteds are actually trimmer than a disposable. Once a disposable gets wet it swells. Cloth doesn't swell like disposables, we don't get that hanging down to the knees, floppy, soggy look from cloth. Once I realized that, I'm so longer obsessed with trim:) I love the workhorse. It's perfectly trim but no leaks either. I wanted a fancy fitted and chose these sadly it did not hold up at all. I wanted a fancy fitted and chose these sadly it did not hold up at all. The material is super soft, but after even one wash/ dry no longer. It gets soaked so quickly, a snap broke and came came out and the fit was so big in the beginning that the poop was oozing out around the legs. Would not recommend. Comment from GMD: The snaps are covered under warranty. Please see the returns page for warranty information. We own somewhere around 30 of these diapers. We own somewhere around 30 of these diapers. They were recommended through a friend when we first heard about cloth diapering over 3 years ago. I didn't buy them because at the time I couldn't afford them.. Instead I spent about a year to 18 months trying every cheap diaper that they make. I wish SO bad I would have just saved up and purchased these to begin with! They've been used on 3 kiddos, and now alternating between a stocky 35lb 2 year old and a skinny minnie 10 month old. I have yet to find a single flaw in these diapers. We use hemp, and thus far we have never had a single issue. We use these fitteds under wool interlock, exclusively for the past two years. Trust me, you want this diaper! Three stars for the convenience of elastic and snaps. Three stars for the convenience of elastic and snaps... These diapers are also very well constructed and do seem like they will be pretty trim once a babe grows into them. I love that they are organic and sourced 100% in the USA, but... Not worth the price in my humble opinion. I cloth diapered my first exclusively in GMD prefolds. I regret selling them to help fund a whole new stash for my new baby - using these fitteds exclusively... REASON #1: I thought I would be able to use the contours (snap-in inserts) as new born dipes/inserts in a NB cover, just as BabeeGreens suggests on their website. NO WAY. JUST DON'T DO IT. I spent the first month washing dipes every day (the contour alone is not at all very absorbant, so they will need to be doubled, which means: more bulk AND more poo leaks) and handwashing/scrubbing so much poop out of wool and cashmere wraps that I felt like I was literally going insane. There were wet wraps and pants hanging up to dry all over the place all the time. I cried every day. No one who is trying to recover from a hard/traumatic labor, struggling to bond with a new baby, should inflict such a pointless misery on themselves. In my case it just ended up to be a tragic waste of time and effort... I wish very much that I had heeded the advice above about them being more appropriate for 12lbs+ and tried the NB workhorse fitteds instead. These diapers are not a NB solution in any sense. REASON #2: I ended up putting the diaper on it's smallest setting as soon as it would fit him, but the diaper alone is NOT absorbent enough (just like 1 contour alone was not absorbent enough, at least for a heavy wetter like mine) This means I have to snap in the contours and again, SO BULKY, even now at 14lbs. Only a few poo leaks to speak of, but even with the contours they just aren't very absorbent. These do NOT work at night. The Cotton/Hemp version is better for that, but poor little guy still wakes up to a completely, utterly saturated diaper and cover in the morning (and I change him once a night). REASON #3: To top it all off, these lost ALL of the lovely softness they had out of the package after just a few weeks of washing, and I wash strictly per directions in a diaper friendly detergent. Now they feel like your standard, nothing special kind of bath towel. NOT what I expected after shelling out somewhere near $700 for 36 diapers (not to mention what I've spent on wraps). Buying organic feels good, but this is not at all an economical option and my baby isn't even comfortable (most all of his fussing/crying has been over these diapers)... Now I'm shopping for doublers and inserts and stay-dry layers etc and starting to feel like anything beyond prefolds or flats is just a racket for $. I bought these because I wanted a SIMPLE solution, but this is not it for us... I am going to resell these and go back to prefolds.